Corrie Witt examines the psychological import and physical reality of domestic spaces with an eye to their importance as a site of memory. 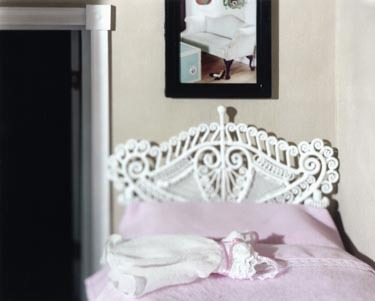 The series Residue pairs photographs of Witt’s childhood dollhouse with images of an actual house, much as the later series The Apartment juxtaposes pictures of Witt’s own apartment with those of its dollhouse-size replica. 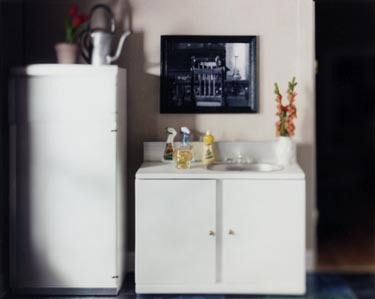 Ambiguous scale and painstaking attention to detail blur the distinctions between the houses and the models, and Witt plays on the confusion by photographing a dollhouse within a dollhouse, or including a photograph from the series as a framed piece on the wall in another photograph from the same series. Ironically, often the only hint that the scene is from a miniature and not real life is that it seems too perfect, too real. If the shoes by the coffee table look casually tossed off, one on its side leaning against its upright mate, they nonetheless feel precisely posed to create just that effect. With nothing out of place, no sign of wear or use, these living spaces seem oddly not lived in. Open doors and pulled-out chairs invite the viewer to come in and get comfortable, yet the sense of something being amiss, the discomforting thought that in fact you may be the resident of the dollhouse, engenders a feeling of claustrophobia and concern about visions of home and issues of control. The large-format negative allows big color prints with exacting detail, yet a shallow depth of field skewers the space with an angled plane of sharpness, replicating the haze of memory and establishing the tension that something is out of the ordinary. The viewer is led to realize how much familiarity with and expectations of the domestic substitute for what is actually seen. 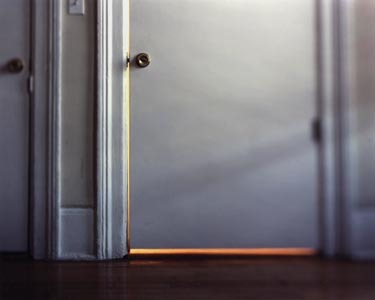 Witt earned her BA from Columbia College Chicago (1998) and her MFA in Photography from the University of Illinois at Chicago (2000). 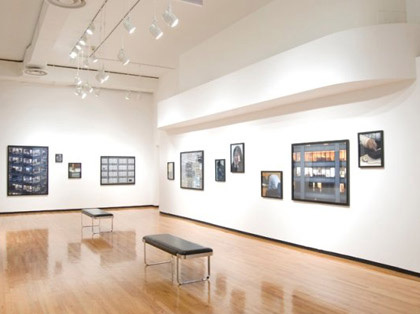 She is the recipient of a 2002 Illinois Arts Council Grant and has most recently exhibited at Zolla/Lieberman Gallery, Chicago; the Society for Contemporary Photography, Kansas City, Missouri; the Wright Gallery, Chicago; and Artworks! Gallery, New Bedford, Massachusetts.